Plumbing problems of the past continue to haunt chipmakers as gap grows between processor and memory speed. If humans ever do create a genuinely self-aware artificial intelligence, it may well exhibit the frustration of waiting for data arrive. The access bandwidth of DRAM-based computer memory has improved by a factor of 20x over the past two decades. Capacity increased 128x during the same period. But latency improved only 1.3x, according to Kevin Chang, a researcher at Carnegie Mellon University, who proposed a new data pathway to address the problem. 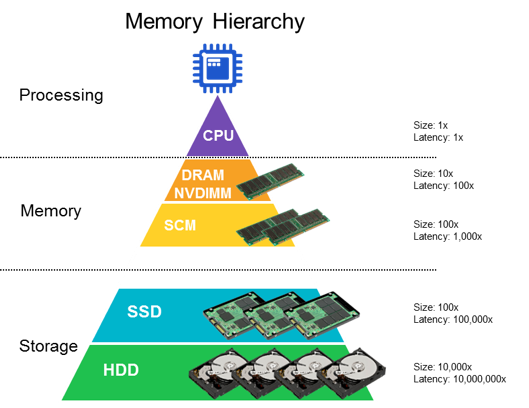 Modern computers, especially data-center servers that skew heavily toward in-memory databases, data-intensive analytics, and increasingly toward machine-learning and deep-neural-network training functions, depend on large amounts of high-speed, high capacity memory to keep the wheels turning. Despite years of effort by researchers looking for better, faster alternatives, DRAM remains a near-universal choice when performance is the priority. That helps explain the surge in DRAM sales this year, despite limited supply that helped drive average selling prices up 74% this year, according to IC Insights. Skyrocketing prices drove the DRAM market to generate a record $72 billion in revenue, and it drove total revenue for the IC market up 22%. Without the extra boost from DRAM prices, which rose 111% in 12 months, growth in the overall IC market would have reached only 9% in 2017, compared to 4% in 2016, the IC Insights report said. Those are impressive numbers for DRAM, a well-worn technology that many people want to replace because it’s not as fast as a processor. There is a long list of current or pending alternatives, but experts seem to consider them half measures that supplant the price/performance benefits of DRAM. It leaves a performance gap with CPUs, as well, even with planned improvements in DRAM performance and new DRAM architectures such as HBM2 and the Hybrid Memory Cube. 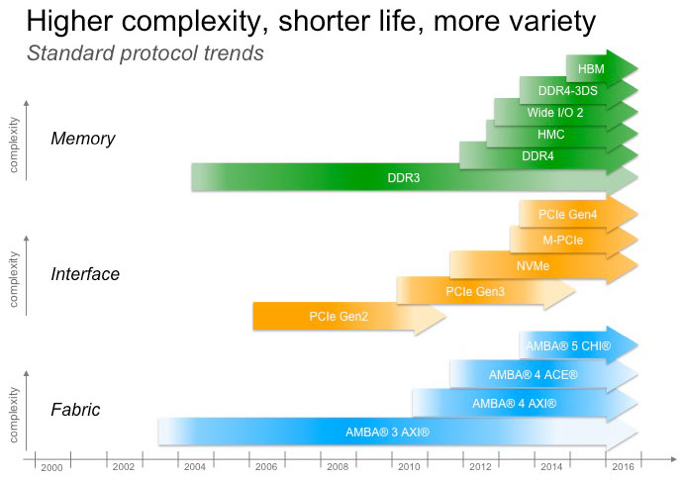 DDR5, the next-gen DRAM specification from JEDEC, will have twice the density and twice the bandwidth of DDR4, which may speed things up a bit, according to Steven Woo, vice president of systems and solutions and distinguished inventor in Rambus’ Office of the CTO. That will be important for performance-intensive, time-sensitive FinTech applications and other high-end analytic, HPC and supercomputing applications—especially when combined with specialized accelerators. GPUs are the clear favorite for training machine learning applications on neural networks, but chip- and systems makers are experimenting with slightly out-of-the-box options like GDDR5, a synchronous graphics RAM developed for game consoles, graphics cards and HPC, which is how Nvidia is using it, according to Chris Rowen, CEO of Babblabs and a strategic advisor for Stanford University’s System X.
HBM2, which is manufactured by SK Hynix and Samsung, puts memory closer to the processor than GDDR5 by placing several high-speed DRAM chips on top of a layer that adds logic processing and an interposer that provides high-speed data links to the processor. HBM2 is an essential element in 2.5D packaging, where blazing-fast speed is essential. HBM2 is a JEDEC standard rival to the Hybrid Memory Cube, developed by IBM and Micron, which uses through-silicon vias to connect various memory layers to a base logic level. Optical connections using silicon photonics also could speed things along. So far, most of the applications of silicon photonics have been between server racks and storage inside of data centers, and inside of high-speed networking devices. Industry experts expect this will migrate closer to the processor over the next few years, particularly as the packaging is fully vetted and design flows expand to include this technology. The advantages of optical are very low heat and extremely fast speeds, but the light waves still need to be converted into electrical signals for storing and processing data. There also are new interconnect standards such as Gen-Z, CCIX, OpenCAPI. There also are new memory types, such as ReRAM, Intel’s phase-changing 3D Xpoint, 3D NAND, and magnetic phase-changing MRAM. NVDIMM is slower but much higher capacity, made non-volatile with the addition of a battery or super-capacitor, which lets them cache far more data than ordinary DRAM while using less power and guaranteeing they won’t lose transaction data if the power goes out. Micron and Rambus are among the chipmakers backing NVDIMM, which could grow in sales from $72.6 million during 2017 and could rise to $184 million by 2025, according to an August report from Transparency Market Research. Every memory architecture has its own advantages to consider, but they all have at least one disadvantage shared by every other integrated circuit – they generate heat. If you could reliably pull out the heat, you could pack memory, processors, graphics co-processors and memory much more tightly, saving space that can be used for more servers and improving performance by reducing lag between memory and all the other components of the system, according to Craig Hampel, chief scientist for Rambus’ Memory and Interface Division. Liquid cooling – bathing components in dielectric mineral oil – cut cooling costs for the HPC cluster at Hong Kong Bitcoin miner Asicminer by 97% and cut its space requirements by 90% according to a 2014 article in IEEE Spectrum. Rambus has been working with Microsoft since 2015 on memory for quantum computing as part of Microsoft’s effort to build a topological quantum computer. Since the quantum processor has to operate at cryogenic temperatures – below -292° F/-180°C or 93.15K — so did the DRAM Rambus was testing for the project. By the time Rambus expanded the program in April, Hampel said, the company was already convinced that serious performance benefits could come out of the cold. 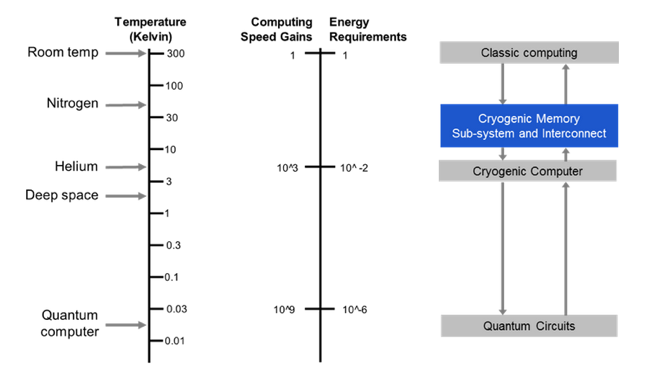 More importantly, if the boost in efficiency at the processor level is mostly consistent in other areas of the data center, cryogenic systems could reduce the need for more data centers by making existing ones more efficient from both a cost and compute-power basis. And it doesn’t even have to be really cold to get most of the benefit; cooling memory to about 77 Kelvin (-321°F/-196°C) delivers most of the efficiency. Supercooling may extend the life of DRAM in the datacenter, but none of the chips or standards on offer will be able to stand up to the flow of data as the industry moves from hyperscale to zettascale, according to Jeroen Dorgelo, director of strategy for Marvell’s Storage Group. DRAM is fast but power hungry, he said. NAND isn’t fast enough to scale, and most of the cutting-edge memories – 3D XPoint, MRAM, ReRAM – also are not able to scale sufficiently. What most datacenters haven’t dealt with, however, is the need to become far more distributed than they are now. That helps reduce the amount of data that has to be sent long distances to be processed, while leaving most of the heavy lifting in the datacenter, according to Yaniv Kopelman, networking CTO of the Connectivity, Storage and Infrastructure Business Unit at Marvell. The pressure of data from social media, the IoT and nearly everywhere else is putting pressure on datacenters to spread out – to build two or three super-scale datacenters across the country rather than one hyperscale monster in the center of it, said Shane Rau, datacenter hardware analyst at IDC. What happens when you use DRAM at extremely low temperatures? Business is booming in advanced memory chips, but it’s getting tougher to test them. Design challenges and tool flow gaps emerge, but so do real-world PPA metrics. As DRAM scaling runs out of steam, vendors begin looking at alternative packaging and new memory types and architectures. I do not know why so many act like there is nothing out there but server. Server is a niche, it’s not representative, it’s not very demanding, it’s insane to focus on it so much. Has high margins and that’s why so many pretend that it must define the roadmap for the entire industry. Server is low efficiency, very high cost, has minimal thermal and volumetric constrains and this kind of article should never focus on server. And ofc server is in a bubble right now as new areas of compute are just starting to migrate towards the edge. The real challenges are not server, you got glasses as the next form factor for personal computing, then there is IoT, robots and so on. Server will need to follow as the solutions adopted in these segments must be 1000x more efficient. As for DRAM, perf and power metrics aside, cost doesn’t scale well anymore, DRAM has to be replaced as it’s not going to be viable anymore.